Schematic of the reconstruction of ancestral pollinators for plants. Another article in the Topic Pages series of PLOS Computational Biology was published this month. It describes the phylogenetic method of ancestral reconstruction. A swimming centipede — did you know? 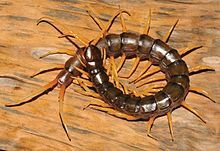 On July 14, the main page of the English Wikipedia ran a Did you know about Scolopendra cataracta, the world's only known amphibian centipede, which had been discovered by an entomologist while on honeymoon and was formally described in May in ZooKeys. The Open Science Lab at the German National Library of Science and Technology has an opening (email announcement) for a Wiki(p/m)edian in Residence to work on integrating images from open-access sources with Wikimedia platforms. Applications close on August 12, 2016. The following represents a selection of the files that have been uploaded this month from open-access sources. Most of these came from PubMed Central through the Open Access Media Importer — whose uploads now total over 22,000. If you can think of wiki pages where these files (or other files from the same source articles) could be useful, please put them in there or let us know. Several of them have already been reused this way, along with many others that had been uploaded earlier. This page was last edited on 9 April 2017, at 15:14.